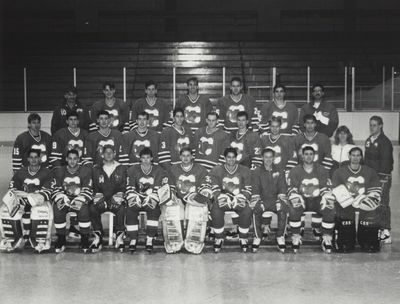 Front row: Dan Nugent, Devin Rubin, Assistant Coach Tom Cranfield, Brian Seims, Derek Lalonde, Dan Barwicki, Head Coach Al MacCormack, Brooks Harter, George Sweetland. Middle row: Nate Leaman, Mark Tyo, Tom Lofberg, Shawn Miller, Mark Hagan, Jeremy Koster, Chris Rurak, Tim Davidson, Mike soscia, Athletic Trainer Robin Nevole, Manager Greg Myers. Back row: Athletic Trainer Marc Chamberlain, Chadd Cassidy, Bobby Gerula, Norman Greene, Kyle Costa, Joe Carusone, Equipment Manager Mike Partigianoni. Not pictured: Kenny Corp, Chris Cameron, Chris King, Pete Carner, Tony Perri.